A mysterious stranger leads a rebellion to liberate a Chinese village from its oppressive overlord in The Man with the Iron Fists 2 , available on Blu-ray™, DVD and Digital HD as well as On Demand on April 14, 2015, from Universal Pictures Home Entertainment. 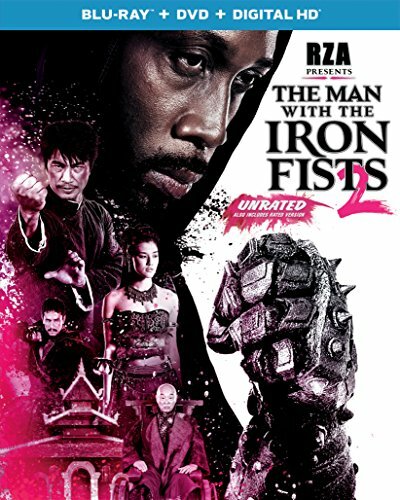 Global hip-hop superstar, actor and filmmaker RZA reprises his role as the enigmatic blacksmith Thaddeus in this explosive sequel to the 2012 action-adventure The Man with the Iron Fists. Inspired by classic kung-fu films, The Man with the Iron Fists 2 Blu-ray™ and DVD are packed with exciting bonus material including a behind-the-scenes featurette, deleted scenes and commentary by director Roel Reiné and executive producer and star RZA. The Universal 1440 Entertainment banner develops and produces live-action and animated productions directly for distribution in all media worldwide. Since its formation in 2005, the group has assembled an exceptional roster of animated family fare, including the brand-new animated feature-length film The Little Engine That Could; the Daytime Emmy®–winning Curious George television series on PBS KIDS; and a string of hit Barbie movies, based on the world-renowned Mattel-branded doll. The group also has successfully built upon some of Universal's highly celebrated live-action franchises, most recently launching the Tony Award®–nominated hit touring stage production Bring It On: The Musical; the epic action-adventure Scorpion King 4: Quest for Power; the adrenaline-fueled actioner Death Race 3: Inferno; and the latest in the terrifying suspense saga Curse of Chucky. Among the projects currently readying for release include and the newest installments of the beloved family franchises, Dragonheart 3: The Sorcerer's Curse and The Land Before Time. Universal 1440 Entertainment is a production entity of Universal Pictures Home Entertainment (UPHE). Universal Pictures Home Entertainment (UPHE) is a unit of Universal Pictures, a division of Universal Studios (www.universalstudios.com). Universal Studios is part of NBCUniversal. NBCUniversal is one of the world's leading media and entertainment companies in the development, production and marketing of entertainment, news and information to a global audience. NBCUniversal owns and operates a valuable portfolio of news and entertainment networks, a premier motion picture company, significant television production operations, a leading television stations group and world-renowned theme parks. NBCUniversal is a subsidiary of Comcast Corporation.